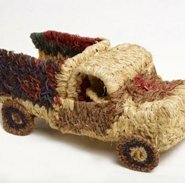 Looking at beautiful and inventive weavings made by Aboriginal people, we will explore different techniques and use a range of found and recycled materials, wire, beads, feathers and sticks to create an object that tells its own story. Art Club is designed for members’ children aged 9-12 years. These monthly classes will broaden your child’s knowledge of art and develop their artistic ability. With each class focusing on a medium and technique, they will also explore the Gallery and gather inspiration for their artwork. As one of our most popular programs, the monthly sessions are now booked individually rather than as an annual series.